I've heard some people say that it's often the guys in their lives that are the hardest to buy gifts for. I find it to be quite the contrary when it comes to those I have to shop for especially my husband. I always joke that he gets presents from me all year long since I'm responsible for choosing his entire wardrobe. This is actually a win-win for us since it means that he'll never wear anything I think is hideous and I happen to have pretty good taste. Well I'm quite sure it's better than most men and he often does gets a good number of compliments on the way he dresses. 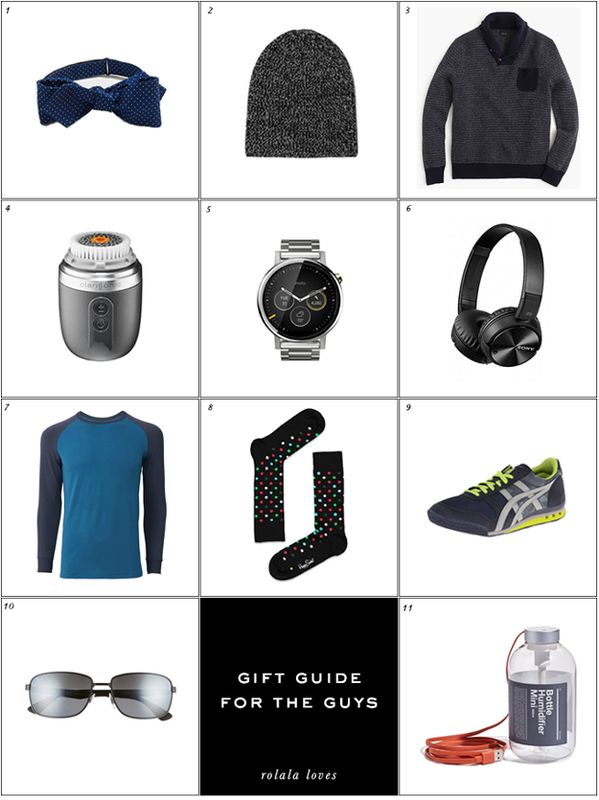 When it comes to holiday gifts, clothing, accessories or tech are usually a sure bet for most males. What do you tend to gift to the men in your lives? Cause bowties are so dapper! A hat should ideally be warm and look good too. Sweaters always make great gifts and this one has really nice looking details. My husband has become a Clarisonic fan since trying mine with his own brush head. If he is willing to use it regularly he should have his own. It's cool how watches do more than tell time these days. A good pair of headphones are a necessity but they shouldn't cost a small fortune. We're big fans of HeatTeach underwear and this baseball style t-shirt can be worn on the outside. Colorful socks are such an easy way for guys to add a little fun to their outfits. One of my husband's favorite sneakers. These have a modern low profile look while being effortlessly stylish. Ray-Bans are so classic and reliable. My husband complains about his office being dry and this USB powered humidifier could be a practical solution. Your husband must be a well-dressed man, then, Rowena, haha. I recently gifted a beanie and a bowtie to my boyfriend during his birthday and I've got to say -- those are fail-proof. Watches and sports shoes are always good options, too. This is a wonderful list, Rowena! Anyhow, I must admit that I do find buying present for men hard, the only exception being my brother. My husband doesn't like presents and he is against receiving and giving gifts at Christmas time because he thinks that makes it commercial. I don't usually shop clothes for him because I never know what he will like...and picking up a gift for my dad is equally difficult. So, I really appreciate your gift ideas and I always like to read gift suggestions at this time of year. In reply to your comment, I really hate stereotypes too! I think we should be past them in this day of time. I am still looking for a birthday and Christmas gift for my special someone. These are some nice suggestions! My husband isn't that hard to shop for, anything technical will do, but my father is a nightmare! Awesome list, I could immediately pick five or six items off that list and know that the hubby would love 'em. To be honest, Rowena, I also find it very difficult when I buy gifts for men. I am sure your hubby dresses great, since I have no doubt you choose only stylish items for him! I like the idea of hat and headphones gift, would use it! Didn't know there was a Clarisonic for men. I think a watch or a parfume is a safe gift idea. Lovely suggestions, thanks for sharing Rowena! i cannot recommend #4 enough for guys!! so good!! I just love these! I'm sure my hubby would love them, too :) Great inspo! This is a really good gift guide, Rowena! Must say this is the first time I heard about Onitsuka but I love the sound of the designs so I'm going over to see the rest of their collections and whoa! Since when Motorola has a smart watch? I used to have Motorola mobiles phone in my 20s, they have some of the best designs! Shopping for guys are already hard enough, especially when you have no clue what they want. I am so loving this entire list Rowena. Great post. Haha you pick his whole wardrobe? That's so funny. Ah, great round up, and a USB humidifier? Wow had no idea there was such a thing, I bet when someone first opens this they don't know what it is but then you have the fun of explaining such an unusual but useful gift. I think my little brother would love that Clarisonic! Amazing collections, love these style, and your post!!! These are SHARP Rowena! So sophisticated! Any guy would be happy to receive these. Thank you so much for this, it all looks great and I have such a struggle picking out gifts for my brothers! that humidifier is a good one! yangkyu also doesn't like it when the space he is in is dry. we always have the humidifier on too when we have the space heater going! My father is the hardest person to shop for- ever. I love the two shirts you picked out. #3 is very distinguished look, which I love. #7 is great for every day wear. I love baseball tees on guys!